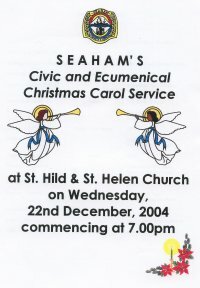 On 22nd December 2004 the Mayor of Seaham Counc. Charles Walker, held the annual Civic Carol Service at St Hild & St Helen's Church, Dawdon. It is an important event in the civic calendar which involves the "Seaham Churches Together" and is attended by civic dignitaries from all over the north east region. This year it was an even more special occasion. 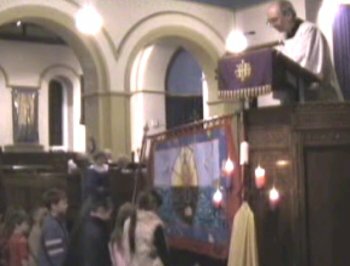 This year the children of Parkside Infant School paraded their banner into church so that it could be blessed by Rev. Graeme Pollock, vicar of Dawdon church. This was with the agreement of the Mayor and Seaham Town Council and the children's banner together with the town's miners lodge banner will now participate on an annual basis. The renovated Vane tempest Banner was brought home by Conservationist Jacqueline Hyman on Wednesday 9th February 2005. The return had been planned for December but the specialist fabrics required proved more difficult to acquire than had been expected. At Seaham's Rock House Community Centre, the banner was carefully unwrapped by Jacqueline who used damage photographs to explain how each part had been restored. Once unwrapped the banner was lift into heavy metal stands and looked impressive. Proudly pictured (left to right) are Dr Eddie Mason, Counc. Ron Meir, Malcolm Smith, Jacqueline Hyman and Tom Race. Children from Parkside Infant School inspected the banner too. They had seen the orginal damage, travelled to Altrincham to see the banner during renovation, had learned about the techniques used to repair the damage and finally they were seeing the finished work. We hope they will be helping to carry knowledge and understanding of our mining heritage forward well into the future. Finally, the children helped to raise the banner into its new glass cabinet where it will be housed and seen by the many people who use and visit Rock House Community Centre. 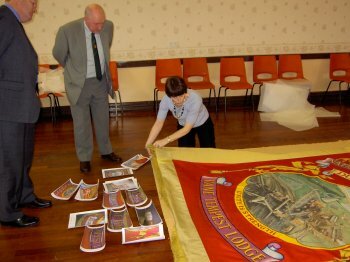 Hopefully, Seaham will soon have its own Heritage Centre and the banner will eventually be moved there. We reflect on all the heritage work and learning that has gone on during this project and wish to thank Heritage Lottery Fund for the support and finance they have given to us. Without them it could never have taken place.